The name of the chateau refers both to the archaic "plessis" (a wooden stockade interlaced with branches) surrounding a mansion, also made of wood, in the early Middle Ages and the Fortia family, from old-established Catalan nobility, which traced back its origins to two brothers, who participated in the conquest of Provence by Raymond Bérenger IV, Count of Barcelona in the 12th century. One of them is descended from Bernard I, father of Bernard II and Sibille, Queen of Aragon by her marriage in 1381 to Pedro IV of Aragon. On the death of the latter, the Fortias fell from favour and fled to France. They first settled in Languedoc where Jean II, grandson of Bernard II, married Françoise de Montpellier in 1448. His son, Marc-Antoine, married Yolande de Benet or de Benoît in 1473, was the father of Bernard III, established in Tours, and Jean III, based in Avignon, where he founded the Provence branch of the Fortia family, themselves divided into Seigneurs (Lords) d’Urban, de Piles and de Montréal. A young Fortia de Piles killed the only son of the poet Malherbe in a duel around 1620 but escaped punishment. Bernard III, Seigneur de Paradis, born in 1475, consolidated his fortune in 1501 by marrying 1501 the wealthy Jeanne Miron, daughter and sister of two famous physicians of the King of France. In 1566, Jeanne bought from Jean de Champagne the manor of Cléreau near Vendôme, land that was part of the manor of Plessis-Fromentières. The latter family, which had owned le Plessis from the early 15th century, had no male heirs, and Anne Fromentières had brought le Plessis as a dowry to Pierre de Champagne, a very great nobleman, whose son Jean de Champagne (mentioned previously) would marry Anne de Laval-Boisdauphin (a younger branch of the Montmorency family). Anne had a younger sister Jeanne Fromentières, married to Jacques de Ronsard, Seigneur de la Roche et de la Denisière, a relative of the famous poet. At that time, there was still no chateau on the manor of Le Plessis, a considerable area, including the two villages of Huisseau and Saint-Amand, a large number of farms and smallholdings (not surveyed at the time), and feudal rights over several smaller manors (including Cléreau), Le Plessis itself being directly under control of the county then the duchy of Vendôme. On 8 April 1599, Philippes or Philippine de Champagne et de Chateaubriand, widow of Gilbert de Puy du Fou, granddaughter of Jean and Anne de Laval-Boisdauphin, sold the manor of Le Plessis to the "noble & wise Lord Bernard de Fortia, Counsellor to the King ... in his Court of Parliament" (see reproduction of the deed). This Bernard V, son of Bernard IV was already Seigneur of Cléreau, having inherited it from his grandmother Jeanne Miron. Having entered the Parliament of Paris in 1585, in 1586 he married Marguerite Leclerc, daughter of a Secretary of the King’s Chamber. Around 1610, he began construction of the present chateau, built of white stone and brick, like the famous Cour des Vosges in Paris. We do not know why, but the work was interrupted around 1625. In 1629, Bernard V died, leaving le Plessis to his son François, a senior judge like himself, the husband of Anne de La Barre, from Ile-de-France. François died two years after his father. He had a minor son, Bernard VI. Anne de La Barre decided to resume and complete the construction. This was done in 1633, when she signed a contract with "Jehan Foy, master mason of Paris, residing at Montmorency", close to the chateau de La Barre. It is likely that the work came to an end in 1638, the date inscribed on a skylight in the west wing, with the initials "BF" (Bernard VI de Fortia, 1623-1694). At this time, the manor, and the chateau, adopted the name "Plessis-Fortia". In 1642, Bernard VI married Margaret Le Mairat, from another great family of judges. He was Seigneur du Plessis, du Cléreau, de Fontenaille, baron de Nouant and had posts as a consellor in various parliaments. He would have two sons, the elder, Jacques married but died childless in 1726, leaving le Plessis to his younger brother, Abbot Anne-Bernard de Fortia, the last of the Touraine line. During his lifetime, Abbot Anne-Bernard sold his manor in 1728 to Charles-Claude-Nicolas Prévost, Seigneur de Saint-Cyr, whose ruined son had to sell his estate at auction. It was bought by René-Aignan Goury in 1755 for 40,000 livres (chateau archives). He arranged for the design of new gardens (clearly not by André Le Nôtre as local tradition would have it, since that great man had died in... 1700). In 1775, the brother of René-Aignan Goury, Charles Jacques and his nephew Etienne-René-Aignan (de) Sanlot inherited from their relative. Filling some of the moat (now drained), adjoining the eastern facade gable of the ‘Great Chateau’, they built a ’Little Chateau’ which still contains some parts decorated in Louis XVI style, as is the ceremonial hall of the ‘Great Chateau’, adorned with pilasters and between them, stretched canvases and painted with vases and flower motifs (this was all restored in 2011 by specialists). The ’Little Chateau’ itself is separated from an annex by a ’Clock Tower’. This annex (which now houses garages) has a beautiful roof in the style of "Philibert de L’Orme", also recently restored. It is due to be converted into a reception room. To all these new buildings, a collective building was added at the end of the 18th century, containing apartments for friends and gardeners, the gas central heating for all buildings and stables for riding horses. In addition, built at unknown periods, a large farmhouse which has not yet been renovated, a large barn and kennels make up the remaining outbuildings. During the Terror in 1792, Goury and Sanlot sold the estate and the chateau to Michel Foucault and his wife Marie-Elizabeth Le Ray de Chaumont, sister of the owner of the chateau of Chaumont, once exchanged by Catherine de Medici with Diane de Poitiers for Chenonceau. Foucault died in 1834, leaving le Plessis to his sister-in-law Thérèse-Elizabeth de Ray. She bequeathed in 1845 to her grand-nephew, Count Charles de Gouvello de Keriaval. In 1913, one of her heiresses sold everything to Belgian aristocrats, the van den Broek d’Obrenans, a family whose second generation was involved in the Resistance during the Second World War. The couple that owned it were arrested by the Germans and sent to a concentration camp. They would not return alive. Their heir sold the land piecemeal, gradually reducing the estate from 500 to 40 hectares. Then, the chateau passed through several hands, and became dilapidated before being bought in 2010 by a family which is undertaking a veritable reconstruction of the interior to install modern amenities while conserving the structure of the past. 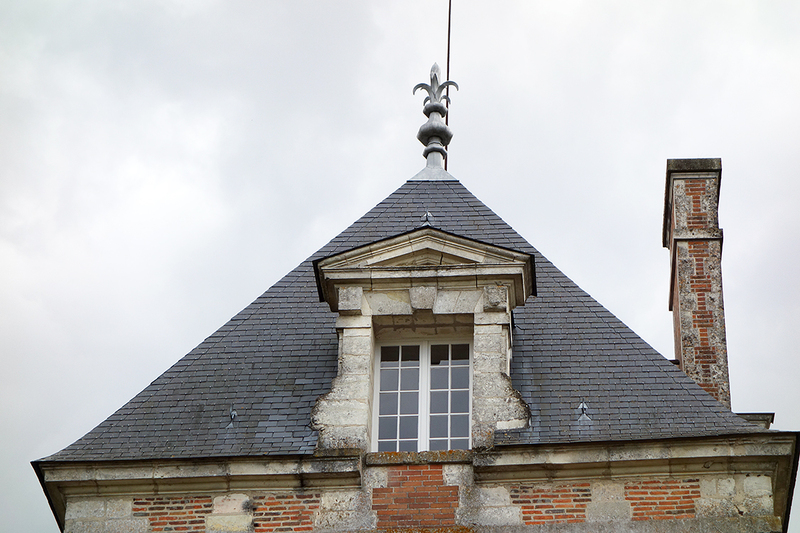 As the same time as complete re-roofing, facades listed as historic monuments, all the windows of the two chateaux (for example) were replaced with new ones in new frames. An "old-style" gateway replaced the two brick pilasters previously placed flush with the national road. 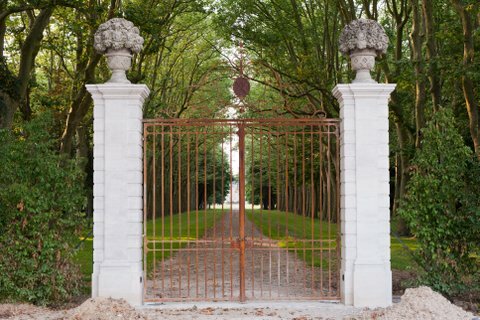 Walkers can now glimpse the façade of the Great Chateau half a kilometre away, at the end of an avenue lined a double row of plane trees.